Absolute measurement of thermal conductivity, thermal diffusivity, and specific heat. The Hot Disk TPS 2500 S thermal conductivity system constitutes an industry benchmark for transient absolute measurement of Thermal Conductivity, thermal diffusivity and specific heat from 0.005 to 1000 W/mK. 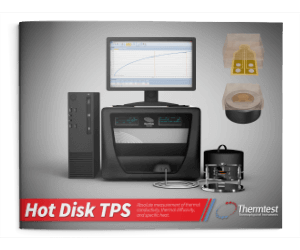 The Hot Disk TPS 2500 S Thermal Conductivity Analyzer is designed for testing thermal transport properties of solids, liquids, paste and powders, including various types of geometry and dimensions with the use of special two-sided or single-sided TPS sensors. The TPS 2500 S Transient Plane Source method meets the testing standard (ISO 22007-2:2015). 1 Although there is no maximum sample size, there are limits on depths of heat penetration. This depth of penetration is determined by available test times and thermal diffusivity (mm2/sec) of the material. With the introduction of the iTPS Plugin, full automation of TPS parameters and calculations is possible. Using the thermal property of effusivity, the human feeling of comfort (coolness or warmth) can be measured for textiles and automotive interiors. In addition to the initial feeling of comfort, covered by the ASTM, this feeling of comfort can also be measured with longer touch times, providing design engineers with a full understanding of how effusivity changes with touch time. The transient line source (TLS) method is commonly used for testing the thermal conductivity and thermal resistivity of soils, rocks, concretes, and plastics. The standard 100 mm probe is ideal for soft, or easy to drill samples, while the shorter 50 mm needle is best suited for harder to drill, rigid samples like rock and concrete. The transient hot wire (THW) method, for thermal conductivity testing of liquids. The THW features unique characteristics to limit the effects of convection; short test times, thin diameter (0.1 mm) wire, and the wire is held in a vertical orientation, when testing liquids. With this control of convection, testing of a wide range of viscosities is possible. A compact, digital, horizontal, single-sample, benchtop system for measuring dimensional changes of solid materials, such as ceramics, glass, metals, carbon composites, cements, minerals, and polymers, from RT to 1000°C. The dilatometer records reversible and irreversible changes in length (expansion and contraction) during heating and cooling.